Below you’ll find the best tactical kukris. The kukri was the weapon of choice for the legendary Gurkha’s. They made this machete famous and now the kukri is one of the most popular types of machetes in the world. It’s great for it’s chopping power but that it can also do the finer tasks. Picking out a single Kukri knife as being the best is really hard and subjective. Each person will have their own preferences and ideas of what makes a knife a really good knife. 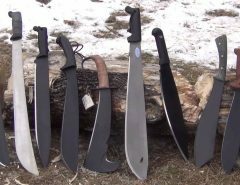 There are a lot of kukri owners that will only use authentic, traditional khukuris that have been imported from Nepal and forged by Kami’s and swear by them. These types of knives have been refined and can be a lot cheaper than a similar quality kukri knife that has been designed and then produced other places. There are different types of kukri’s that offer different blade steels, and handle materials that are made from other materials than bone or wood which give more traction for better grips. The sheaths are a lot more durable and versatile as well. Kukris knives are also used for heavy to moderate chopping, but they can also be used as very all-purpose survival weapons. Anyone who has used a lot of kukri knives, will have their own opinion about what is considered best, so instead of just picking one knife as the best, we will go over the top 3 of the most praised and popular models among collectors and enthusiasts. Each kukri that is mention is only high quality and will receive many positive reviews from owners, so you can’t go wrong with whatever you pick from this list. They all have unique designs and traits. This is one type of kukri that will have you drooling. It weighs less than a pound and is really light for being so big. It is easy to carry around weather it is in a bag or in a belt strap, but it is heavy enough to really make sure that you don’t have to put a lot of force behind your swing to get that output that you want. 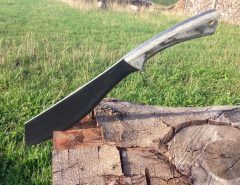 The kukri is a fixed blade design that comes with a full tang. It is 15 inches long and the blade is only 9.25 inches long. The cutting edge is along the whole part of the lower part of this kukri. This gives you more of a cutting surface to use. It does come in pretty handy when you using for various jobs like detailed to fine slicing. The blade isn’t really that thick and gives you the perfect balance between being too firm and it is just the right amount of sharp to be efficient. You can use this model to baton, slice, chop. Once you get it out of the box, it isn’t that sharp but once you put a fine edge on it, it can go through some of the thickest shrubbery and limbs. It also comes with a nylon sheath that is meant to use to keep the knife safe. It also has a strap fastening system that is easy to use and secure. 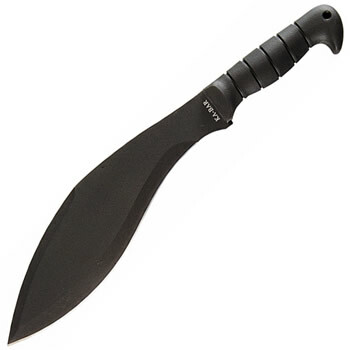 When it comes to this type of tactical kukri you will find that this one really takes the cake. It is around 15-inch-long and the blade is made from 9.5 inches of stainless steel that is about 7mm thick. It does come sharpened so you do have to be careful when taking out the package. It also has a nylon sheath that is really made well, which really surprised me. It weighs less than 2 pounds, which means it is good for traveling with, especially if you plan to be outdoors. It has no issues with cutting down small trees or clipping branches and more. 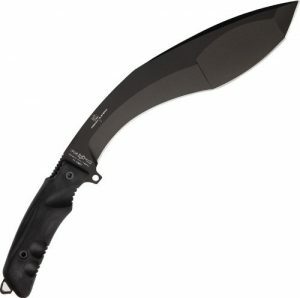 This is one kukri that I was amazed about. It doesn’t seem to be that popular but the reviews about it were amazing. There are always those negative Nancy’s out there that state it isn’t worth it, but for the price, you are getting what you buy. Sometimes it does come unsharpened, so you may have to sharpen it. 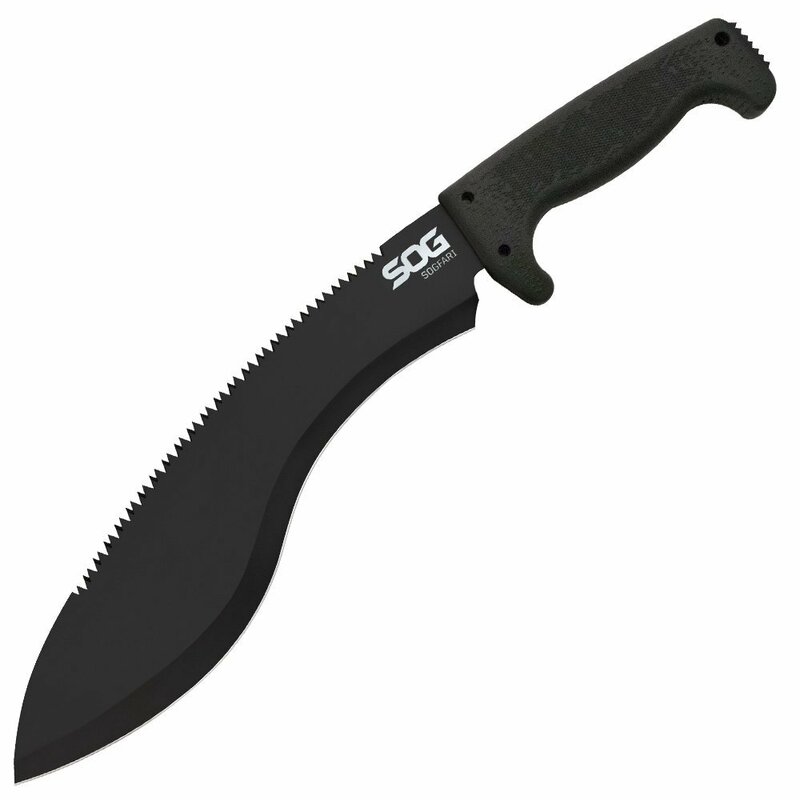 This unique kukri is one of the additions to the SOG family. It is one of those kukris that make you say that I want this and I gotta have it now. 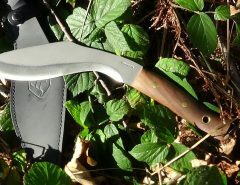 This kukri can clear brush, blaze trails, and even chop wood for shelters. It has even been used in some countries where it was used to harvest crops. You can even use this kukri to prepare meals. 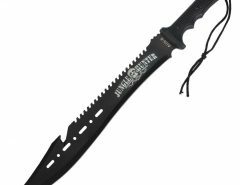 The SOGfari is really there to do what you want it to being 18 inches long and having a 12-inch blade. 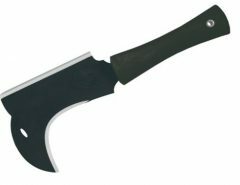 It is made of high carbon steel and the blade is straight edged which cuts through basically anything, and it can be easily sharpened that has a working saw attached to the back. It weighs less than a pound and it comes in a black finish. This is a really great survival tool because it is great for adventures and explorations. The handle is really comfortable to hold onto for long amounts of time. There is even a spiked tang that you can use on the back of the handle that you can use for scraping and pounding. This SOG product is known for having an uncompromising style and performance that really states just how great it is. It is popular among military, law enforcement, and even industrial workers as well. You can literally use this kukri for just about anything that you can think of. SOG products are pretty futuristic as they use a really nice version of carbon steel that is super strong and hardly ever bends. This kukri alone has won awards and has been recognized worldwide. Whilst I like this tool, it is a budget option that doesn’t really compare to the top models. As an entry level model it’s perfect, if you’re life depends on it, the other options are better. So, what type of kukri is the best? There isn’t a right or wrong answer to that. Any of the blades mentions are a great choice. You could also find a dozen more kukris but they won’t be as good of quality as these are. The blade steel, handle materials, and sheath are some of the things that you should really look at. With one of these models, you certainly can’t go wrong.